Viper’s bugloss is a very distinctive, roughly hairy, medium to tall grassland biennial. It has a tall unbranched spike covered with many curved sprays of flowers which start as pink buds and open out into brilliant blue trumpet shaped flowers. Flowering occurs from June to September. Viper's bugloss is a biennial which requires free draining reasonably open grassland or disturbed soil in which its seed can germinate. It is found in bare places on down land, in heaths and on more disturbed habitats such as cultivated land, railways and roadsides, cliffs, sand dunes and shingle. Viper's bugloss has a deep and persistent root which allows it to exploit free draining, drought prone land. 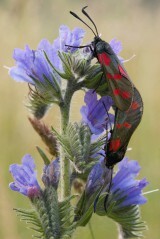 Viper's bugloss is pollinated by a range of 'long tongued' insects including bees, butterflies and moths.